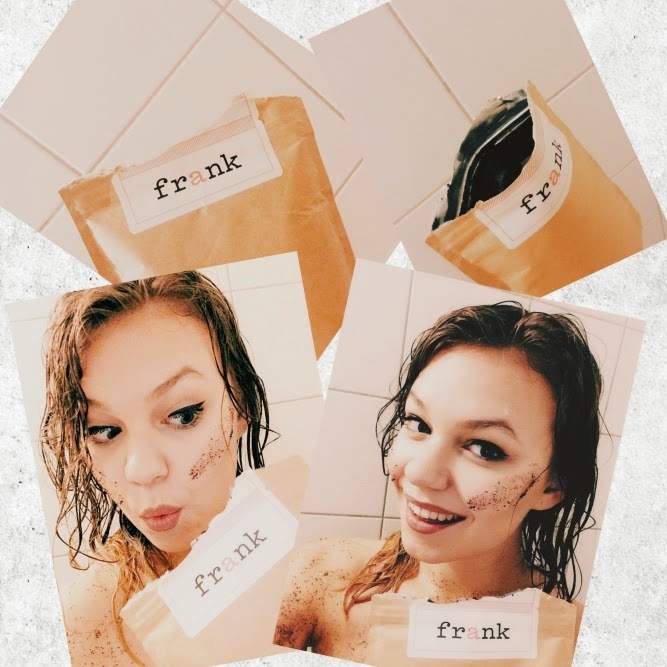 Yesterday I first tried this super trending product called Frank Body scrub. And, to be honest, my expectations weren't that high since I have always made a coffee scrub by myself and it worked really well. I mean, why would I pay extra money on this kind of scrub, if I can do the same at home. Not exactly. First impression when receiving the package was really good. I love how personal they make it and let you believe that 'Frank' is actually your pal and cares about how you treat your body. Who knows, but I love the idea. Then comes the part where you open the package by tearing the top off and smell the product. I was impressed that it didn't have any obnoxious perfumes in it and the scrub smells wonderful, natural (like coffee, of course) and with a tiny hint of almonds. You can choose which one your prefer from 4 types of scrubs - the original that I have, cocoa, coconut and peppermint, which is the newest one it the range. By the way, they just released a body balm, so I can't wait to try that one. They say that 2 small handfuls of scrub should do the trick and cover your whole body, that's exactly how much I needed. Then I gently rubbed the scrub on my body (focusing on problem areas) with circular movements. This part felt amazing because, as a scrub, I could feel the rough coffee touch and it felt like I am actually cleaning off all of the dry skin and cleansing my body. Wait 5-10 minutes and rinse it off. Oh my.. This felt so good. The almond oil that's in the scrub left my skin smooth and soft. I could not stop stroking my legs, haha. Since scrubs shouldn't be used more than 1-2 times a week, this product will last a while for sure. Lately I have been feeling slightly depressed and tired so this was a great way how to treat and cheer myself up. The coffee really woke me up and the process felt like a massage. I highly recommend this to everyone. The product comes from Australia and is vegan, which is even better. The shipping is free all over the world as well, which is a HUGE plus from me. I will definitely continue using this scrub and try the other types as well. I suggest you go to their website and read about all of the other scrubs as well. Give it a go! I loved it.